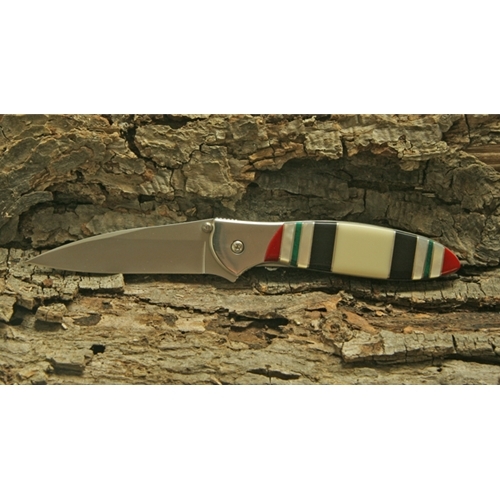 A stunning combination of Coral, Mother of Pearl,Jade, Jet Stone and Bamboo Stonepolished to a smooth finish that brings out the rich color of these stones make this handle of the Kershaw Leek a standout. The Leek features a distinctive design as well asSpeedsafe ambidextrous manually assisted opening. With Speedsafe, the user can smoothly and easily deploy the blade with either hand. Merely press the small kick that is showing on the spine and the blade deploys instantly with an authorative snap. The Leek comes with a secure locking liner and a removable/reversible pocket clip for tip-up or tip-down carry. This Leek features Sandvik 14C28N stainless steel that hones to an incredibly sharp edge, re-sharpens easily, and strongly resists corrosion.